Lloyd C. Leach passed away March 2, 2018, at the age of 83. He was born September 10, 1934, in Scotts, Michigan, to Floyd and Ruth (White) Leach. He is deeply loved and will be missed by his wife, Betty; his children, Steven Thomas (Carol) Leach and Jane Elizabeth (David) Brogan; and his grandchildren, Nicholas Joseph Brogan, Nathan Lloyd Brogan and Annalyse Leach Brogan. He is preceded in death by his parents and his siblings, Phyllis Speck, Robert Leach, Thomas Leach and LJ Leach. Lloyd began his 41 year teaching journey in Breckenridge, Michigan. It wasn’t long before he moved to Plymouth, where he taught Chemistry at the old Plymouth High School. He then moved to Salem High School from which he retired in 1993. He was a resident of Plymouth for 29 years, then of Northville for 30 years. 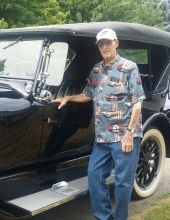 Lloyd was a member of Plymouth First Presbyterian Church and the Vintage Motor Car Club of America, Huron Valley Chapter. At one time he served as the club’s President. He loved antique cars, and Lloyd and Betty traveled all over the United States with their antique cars. It was a rainy day in Plymouth when Lloyd offered Irene Waldorf a ride home from school. When they arrived at Irene’s house she introduced him to Margaret Dunning, which began a long friendship and a mutual love of old cars. He also loved traveling, having traveled with Betty to Europe, but most of all Lloyd loved spending time with his family. He was loved and will be missed by many. Friends may visit at the Schrader-Howell Funeral Home, 280 S. Main St., Plymouth, Tuesday, March 6, 2PM until 8PM. There will be a private family service followed by burial at Riverside Cemetery, Plymouth. Memorials may be made to Angela Hospice. "Email Address" would like to share the life celebration of Lloyd C. Leach. Click on the "link" to go to share a favorite memory or leave a condolence message for the family.